Once upon a time, billboards were an effective way of marketing your business or practice. Keep in mind, however, that 2009 was before the majority of the population had smartphones, an invention that shifted the marketing landscape as we knew it. These days, the words “digital advertising” is on everyone’s lips, and it may feel like traditional advertising has fallen by the wayside. But has it? In other words, do billboards still work? The answer is yes and no. Billboards can be an excellent way to increase brand awareness, particularly if you’re able to afford one along a well-traveled road. Unfortunately, billboards also have a number of disadvantages, particularly for people with small businesses and people who live in rural areas. Compared to other forms of marketing, billboards are remarkably expensive. Purchasing a billboard in a small, poorly-traveled area can cost hundreds of dollars, whereas buying a billboard in a high-traffic area can cost thousands – or even millions. Despite the high price tag, billboards are only temporary. Billboards can only be rented out for weeks or months at a time. If you want an enduring marketing campaign, it’s better to stick to the internet. Billboards don’t allow audience segmentation. Audience segmentation, or dividing your potential patients into subgroups (i.e., segments), is an excellent way to take your marketing to the next level. By segmenting your audience, you can craft the perfect message for each group of prospective patients, focusing on their unique needs and pain points. For instance, if you’re interested in marketing LASIK, you want to focus on people between the ages of 18 and 40. If you’re interested in marketing cataract services, you’d benefit more from marketing to people older than 60. Billboards are targeted to every driver on the road, regardless of whether or not they meet your patient criteria. When people are driving down the road, they don’t have time to read more than a couple of words. People who market with billboards need to be extremely brief, a limitation that all but disappears with digital advertising. Billboards only work if people see them. If your practice is in a rural area, it can be difficult to find a road that’s well-traveled enough to make your billboard worthwhile. 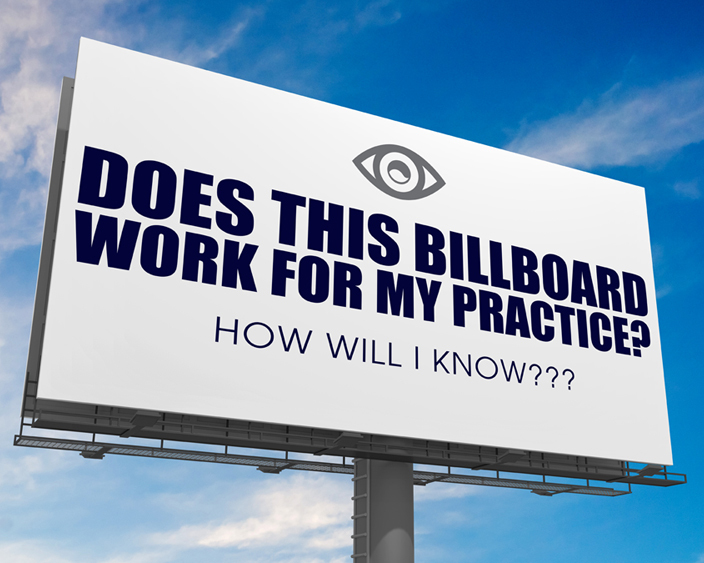 In the end, billboards can be a valid way to market your ophthalmology practice, but only if you’re willing to spend several thousand dollars on a short, pithy message in a high-traffic area. Other marketing techniques – for instance, digital marketing, patient education, or social media contents – may provide more value at a lower price. Sightpath Creative can help assess, create and deploy messages for you all year long. Learn more about Sightpath Creative.